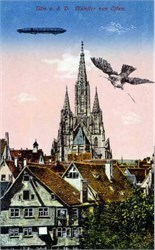 Early Litho Postcard showing Zeppelin flying over a church in Germanany with a dove in the foreground. The postcard was made in the 1920's or earlier by Hans Wutz of Germany. Card is unused and in overall good condition.